Want to be notified of new releases in lolautruche/sqliimport? SQLIImport is an extension allowing to import external content in eZ Publish. It provides a framework for content manipulation and a simple interface for developing import handlers, so as a GUI to administrate your imports in the admin interface Import handlers are classes you need to develop in order to process external data (XML, CSV, ...) and import it into eZ Publish (see Handler Development section). This eZ Publish extension is provided as is, in GPL v2 (see LICENCE). This extension has been written by Jérôme Vieilledent and sponsored by SQLi. Oracle adaptation has been made by Simone Tellini. Each import is stored in the database as pending and awaits for the cronjob to process it. Pending imports can be cancelled while the cronjob has not processed it. Immediate imports are one-shot, meaning that they will not repeat in time, contrary to scheduled imports. To add an immediate import, click on Request a new immediate import in the left menu. Choose your import handler and eventually add options (see Runtime Options section below). To add a scheduled import, go to Scheduled import(s) by clicking the link in the left menu, and click Add a scheduled import. 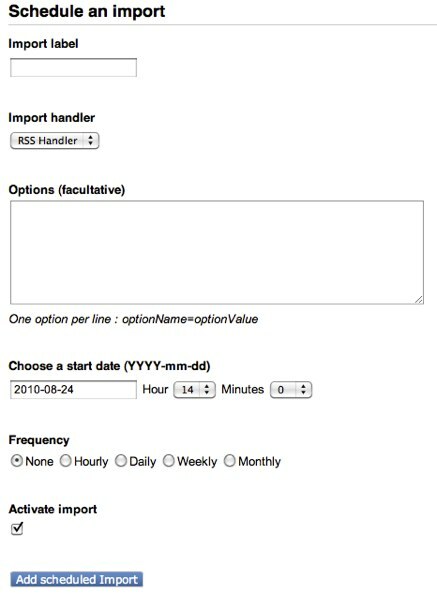 Choose your import handler and eventually add options (see Runtime Options section below). If your import handler supports Runtime options (see Handler Development section), you can add them from the admin interface. You can only add one option per line with format optionName=optionValue. Options will be passed to the import handler at runtime (in the handler constructor). Running imports are safely interruptable from the admin interface or from the CLI. From the import list, you can interrupt a running import by clicking the Interrupt link of the import. Please note that you will need to have access to the manageimports policy function for the current import handler. Please note that kill -9 (SIGKILL) signal cannot be caught, so always prefer using SIGTERM (kill -15) or SIGINT (kill -2). You can also ask for import interruption by pressing Ctrl+C, which sends a SIGINT signal. SQLIImport provides both a cronjob and a regular CLI script. The cronjob is used to process imports added from the admin interface (immediate and scheduled). The regular CLI script can be used to trigger a quick one shot import, without having to go into the admin interface. Comma separated source handlers identifiers. If not provided, all source handlers will be processed. Options for import handlers. Should be something like --options="handler1::foo=bar,foo2=baz|handler2::someoption=biz"
Several performance settings are set in sqliimport.ini configuration file. For more details, read the inline comments in the INI file. Same as for ViewCaching above. Import will be much faster with ObjectIndexing set to disabled. Will just activate site.ini SearchSettings.DelayedIndexing for current import script. Content objects will be indexed once import has been done, via sqliimport_cleanup cronjob. If bundled content manipulation framework is used, the system will do comparisons in order to check if it is really necessary to create a new content object version. By default it compares the string representation of each attribute content, but the diff system is extendable. It is thus possible to define new diff handlers for each datatype. For more information, please read the DIFF HANDLER DEVELOPMENT section. To import external content into eZ Publish with SQLIImport, you need to develop a handler that understands the external source (whatever it is) and maps it with your eZ Publish content structure. Developing an import handler is fairly easy. You just need to create a PHP class that extends SQLIImportAbstractHandler and implements ISQLIImportHandler. You will also need to declare it in an override of sqliimport.ini by creating a dedicated section (please read inline INI comments for further details). A full working example is provided (SQLIRSSImportHandler). Check it to understand the mechanism. Note that all configuration set in your INI handler block in sqliimport.ini will be available in your handler in $this->handlerConfArray. SQLIContent framework relies on string representation of content attributes. It makes use of datatypes fromString() / toString() methods, implemented in every kernel datatypes since eZ Publish 3.9. So if you use custom datatypes, make sure they implement these methods for better result. If they are not present, the framework will use data_text instead. For more information about string representation of kernel datatypes, please read fromString.txt appendix. For more examples, please check scripts located in the stubs/ directory. 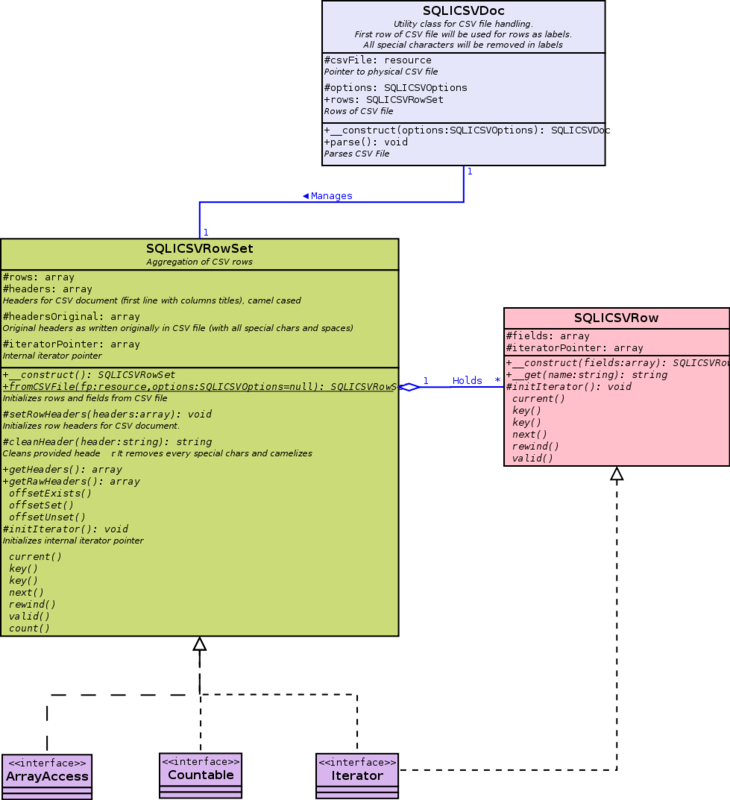 You can also have a look at the UML diagram below. When manipulating SQLIContent framework, you can tweak several options. All of these options are packaged into objects, usually passed to a constructor/singleton (SQLIContent, SQLIContentPublisher). remote_id => RemoteID of your content. Use it to retrieve/update your content later. Default is NULL. section_id => SectionID of your content. Default is 0 (let the eZ Publish decide regarding tree inheritance). creator_id => CreatorID of your content. Default is false (currently logged in user). language => Content language. Default is your default language (cf eZContentObject::defaultLanguage(). These options are used when instantiating an SQLIContentPublisher object. As the publisher is a singleton object, you can alter its options with its setOptions() method. parent_node_id => DEPRECATED, use content locations instead. Defines ParentNodeID for content. modification_check => If true, makes the publisher to do check if at least one attribute has been modified before publishing. If not, the content is not published. Default is true. update_null_field => If true, will update all attributes in DB, even if data is not set (null), and set it to null. Default is false. SQLIXMLParser - Catches parse errors and fetches XML string. Transforms PHP errors into exceptions. Works with DOM or SimpleXML (example in stubs/xml.php). SQLICSVDoc - Set of classes to manage CSV structures as easily as with SimpleXML (example in stubs/csv.php). When updating a content, SQLIContentPublisher only publishes really modified content by default. It makes a diff between already stored content and new content. This is done via diff handlers. You can develop your own diff handler for your datatypes by creating a class implementing ISQLIDiffHandler interface. Only one static method is needed : contentIsModified(). Please read interface PHPDoc for further information. You can also check the code of provided handlers for examples.